Peaceful Ocean Views with Waterslide and Elevators Too! 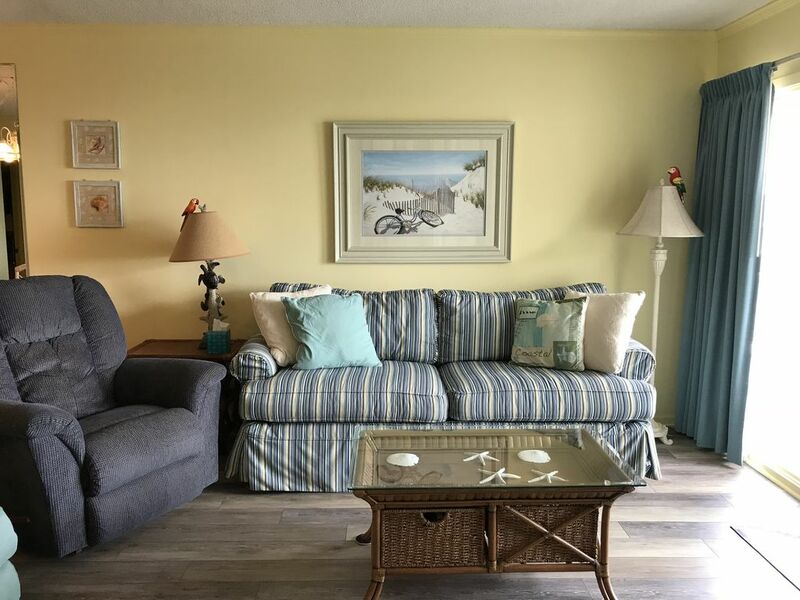 Our beautiful 2 bedroom, 2 bath condo at APATB is where your beach memories will be full of sun, water and fun. From the beach to the waterslide/pool to the miniature golf there is plenty of fun for your whole family. After your busy day relax in your home away from home. There are 2 TVs located in the living room and master bedroom with DVD and wireless internet. Property amenities include waterslide with outdoor pool, indoor pool,spas, miniature golf, tennis, basketball and BBQ grills. Come and enjoy the beach! NEWLY RENOVATED BATHROOMS AND FLOORING! We had a great time. The condo was comfortable and had everything we needed. It was a short walk to the beach and onsite pool. We loved it and we will stay again! It also had HBO so we didn’t miss the Game of Thrones premier! So happy to find a condo to rent at A Place at the Beach. The condo is exactly as pictured, and very clean! The recently renovated bathrooms are nice, we especially like the curved shower curtains. A major plus is bed linens and a set of towels is included with the rental. (Very nice towels too!) Washer and dryer in unit was so convenient. The owner is very easy to work with and I am so appreciative that she was willing to work with the days we had available to vacation. The location is great. The beach is not crowded, and the beach is very wide. It is convenient to restaurants, grocery stores, Cape Lookout, Fort Macon, etc. The pools are awesome! I really wanted to stay here because of the indoor pool so we could take a break from the sun. We ended up only going to the indoor pool once though because the water slide at the outdoor pool was so much fun!! And this condo has an elevator which was a lifesaver with as much stuff as I pack! We were able to get a luggage cart and hop on the elevator to the third floor in one trip. The security personnel are always near by and so friendly! Doug (security) is always smiling and makes friends with everyone. This was our first time to Atlantic Beach, but hopefully not our last. Great condo. Clean and comfortable. This unit is close to the ocean. I would definitely rent this condo again. It's a great location with close proximity to the beach. It was nice having the Necessities such as toilet paper, paper towels, hand soap and dish soap provided upon our arrival. Other places I have stayed did not provide these. There was plenty of comfortable seating in the living room. The first night I had to contact the owner regarding something that was broke and she responded right away. The issue was resolved first thing the next morning. The only thing that I would recommend is a TV in the second bedroom and a larger coffee pot. My family and I really enjoyed staying at this property. The owner was easy to communicate with. It's a short, easy walk to the beach. The pool is fantastic! The condo was exactly as described and pictured. It has all your basic needs. We did not really cook in the kitchen (did breakfast and lunch there and dinner out), but it seemed to be well-stocked with what you would need. Having a washer and dryer in the unit was extremely helpful (actually, essential with two small kids). This was our first time at Atlantic Beach, and I think it could become a regular vacation spot for us. Condo well kept!!!! Games supplied & dishes! Excellent property!!!!! Enjoyed the security they had at property!!!!! Will rent that condo again. Great views!!!! My family and I have stayed in this unit several times in the past couple of years. The unit looks exactly like the pictures on-line. It is clean and well equipped. From the minute you first walk in the door it feels like "home away from home"; very relaxing. The Owners are helpful and easy to work with. I would recommend this unit to anyone who wants to have a relaxing and enjoyable stay at the beach. We look forward to going back again . . . . real soon.